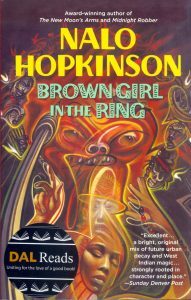 We are pleased to announce the Dal Reads selection for 2018/19 is the sci-fi novel Brown Girl in the Ring by Nalo Hopkinson. Set in the near future in a dystopic Toronto, Brown Girl in the Ring contains themes of folklore, feminism, and magic realism steeped in Afro-Caribbean culture. The novel won multiple awards around the time of its release in 1998 and was a Canada Reads finalist in 2008. It’s an important book to explore as we celebrate Dalhousie’s 200th year. Dal Reads is the unity reading program at Dalhousie, designed to encourage community engagement and thought-provoking dialogue among readers. Pick up a free copy at one of the five Dalhousie Libraries and watch for an announcement regarding public events with the author later this year. You’ll also be able to follow any conversation about Brown Girl in the Ring on Facebook, Twitter, and Instagram using #DalReads. This will be a great place to post your thoughts or any questions you might have about the book. Looking forward to reading and discussing Brown Girl in the Ring with you!